In response to the impact of computer technology on communications and industry, CCRI offers various degree and certificate programs through the Computer Studies and Information Processing Department. 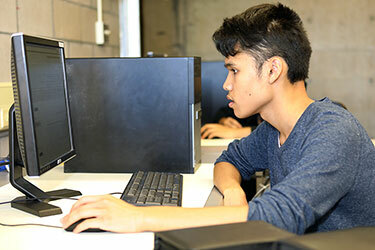 Computer Programming prepares students to enter a modern programming environment. This degree program stresses problem definition and solution design using different programming languages in the development of applications. Computer and Information Processing Concentrations prepares students for careers in modern office environments, emphasizing both client and server technologies. Cybersecurity is one of the fastest-growing, high-demand fields of information technology and the workplace in general. This degree program offers students the opportunity to acquire the skills needed to compete for these jobs and to prepare for a career in cybersecurity. The program will also provide a strong foundation for students intending to pursue a bachelor’s degree in the field as well as an opportunity for industry professionals to update their skills to meet the demands of their employers. Computer Networking Technology places an emphasis on operating principles of hardware and software, networking models, operating systems, internetworking components, and industry standards along with hands-on laboratory activities for developing practical problem-solving skills. Computer Programming, General Information Processing, IT Support Specialist, Networking, Web Technologies, Office Automation, Networking Technician, Advanced Networking Technician, and Computer Desktop Technician. Certificate programs emphasize technical coursework only and do not require students to take electives that are required in the associate degree program.